Casino.com Review - 800% Bonus Spread over First 8 Deposits!! If you’re anything like us at Mobile Bingo Bonuses, then you’ll love to find top quality casino sites who offer the ability to pay by phone bill. 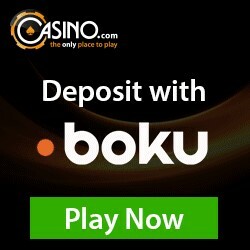 Well hurrah we have one called Casino.com who not only have Boku, but also a progressive state of the art theme which will make gaming online a pleasure. Great sites must of course offer lots of games and Casino.com certainly tick this box, because they bring you scratch cards, video poker, live games, table games, card games and video slots such as White King and Irish Luck. Many of these games are not only on desktop but also mobile and tablet devices, bringing thrilling jackpots to the palm of your hand. 8th deposit, 100% cash match bonus up to £400. If £400 is a little too much, then think about how much you’ll receive for £10 on each deposit. You’ll get £80 in bonus credit, or a grand total of £160 to game with. Red or Black – Wednesday may be hump day, but it also brings a choice of 2 incredible casino bonuses. Although each offer has different wagering requirements, you can choose code RED for a 100% cash match bonus up to £400, or BLACK for 50% cash match up to £400. Make your Match – Every month Casino.com bring you a 100% reload bonus up to £500 (£1,000 for VIP’s) on your 1st deposit. Simply use the code FIRST1 and the credit will be added to your account. Great casinos should be shared, so why not tell your friends about Casino.com. If they register and deposit, then you’ll receive £50 in bonus credit. There’s a limit of 20 friends, but that still makes £1,000 in bonuses which can be used anywhere on the site. Returning players will soon notice that as they game they have accrued points. This is via the Casino.com loyalty scheme, which has five levels (Bronze, Silver, Gold, VIP and VIP Elite) each offering bigger and better rewards. The points earned will depend on the type of game, so we always recommend checking out the terms and conditions. You join the VIP scheme when you reach 20,000 points and can enjoy reload, special gifts and higher conversion rates; plus your own personal account manager. What makes this VIP Club stand out is the fact that when you become a VIP you’re one for life, because many other sites have minimum limits per month. Should you require any customer support, you can access a representative through email or telephone. Casino.com love keeping their players updated on the latest games and promotions via their social media pages. They are available on Facebook, Twitter, Instagram, You Tube and even Pinterest. They accept the usual Credit and Debit Cards, Neteller, Soforit, Paysafe Card, Entropay, Skrill and Boku. If you’re wondering what on Earth Boku is, it’s the ability to pay for your gaming credit using unwanted phone credit or your mobile bill. You only need to provide them with your mobile number and confirm acceptance of the banking method, then you can deposit and simply pay off when the bill comes through. To take advantage of these amazing bonuses especially the 800% cash match welcome bonus, then head over to register with Casino.com.